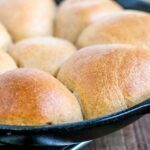 30 Minute Dinner Rolls – Make these dinner rolls from scratch in just about 30 minutes!! 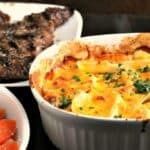 These are great for holidays, weeknights, basically – any time you need them. 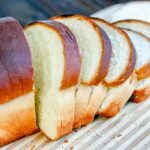 Using a stand mixer and simple ingredients, you can have these homemade rolls on the table FAST!! I’ve long been a fan of my bread maker. It takes all the work out of bread and pizza dough, and turns out a consistent product every time. BUT, it takes an hour and a half to be ready to pull out and shape/bake – and then needs to be given more time to rise…. and I needed them (and dinner) to be ready in 45 minutes. These are great for holidays, weeknights, basically – any time you need them. I mean, look at the fluffiness!! If you are worried that they’ll be overwhelmingly yeast-y tasting (2 Tbs yeast sounds like a lot), stop worrying – they’re not! These are tender-soft, and and absolutely divine. You need these in your life. Go, make a batch. Please. Add some of the flour, the salt and egg into the yeast mixture using a dough hook, and mix, adding remaining flour gradually. Mix until a smooth ball forms, then divide into rolls. Allow to rise, covered for 10 minutes. Preheat the oven while you wait! Bake for 10 minutes, or until the tops are golden brown. Brush with butter, and serve! Want more bread? How about these? 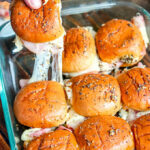 WANT TO TRY THESE 30 MINUTE DINNER ROLLS?? PIN IT TO YOUR BREAD, DINNER OR HOLIDAYS BOARD! What do you do when you need dinner rolls soon, and want them to be homemade, AND you need them asap? MAKE THIS RECIPE and pull hot, fluffy rolls out of the oven in about 30 minutes. In the bowl of your stand mixer, combine the warm water, oil, yeast, and sugar. Add 2 cups of the flour, the salt, and the egg into the yeast mixture using a dough hook, and mix. Add the remaining flour gradually. Let your mixer do the work and let it knead it all together until it becomes smooth ball. The dough will be fairly soft. Let dough rest for 10 minutes, and heat your oven to 400F. Bake for 10 minutes or until tops are just golden brown. Remove from oven, and brush tops with butter. Love finding new easy quick dinner roll recipes. Made them and love them!!! My weakness!! These look mouth watering good!! Thank you for sharing!! Oh they look so fluffy n ready to eat! Love it. Nothing beats the aroma of fresh baked bread…and these sound awesome. I love fresh dinner rolls…will have to give them a try. These would not last long in our home! I’m pretty sure my fiancé would eat them all! Looks good!! I can’t wait to make these! I love homemade rolls but I hate how long they take so these sound perfect! 30 minutes! That is amazing! Can have these any night! I really need to try these! I have a weakness for homemade bread. Yum!! Yum! If only I wasn’t gluten intolerant! I’m working on some Gluten Free options for people with intolerances, I’ll let you know what I come up with! Ha! I love that there are others out there that are too lazy to take out a kitchen appliance. LOL Although I have to say since I put in the pull out drawers in my cabinets I do use all my stuff more. Regardless, these look and sound delicious! I did use my stand mixer, but that’s on the counter all the time. The bread machine is kept in the garage, because.. ya know… I have too many things already! Ready in 30 minutes? SOLD!!! These look carborific! Love that they are so easy too! these look awesome. Ive been craving rolls (if you knew me you would know that is totally normal lol). I crave rolls on the regular, myself. These require NO pre planning. You can make em while you prep dinner! These look soft and yummy! I love a quick homemade dinner roll. I’ll add this one to my recipe box! So much better than the bagged rolls in the supermarket! These look so easy and tastey! My go-to recipe is one of those that takes FOREVER. I’ll definitely have to give this one a try and save some time! Trying these, I’ve always wanted to attempt to make dinner rolls! Let me know your thoughts when you do, Tamara! Been wanting a quick and easy dinner roll recipe, thanks! Thank you for this recipe! I made these for our big family Christmas this weekend and everyone loved them! And 30 minutes start to finish…perfect! Oh My Gosh YUM!! They look delicious! mixer doesn’t have a dough hook, so now what? Without a mixer and dough hook, you’ll need to knead (see what I did there?) by hand. Might take a little longer, but not much! Good workout! Mine came out doughy. I bake home made bread every weekend and was hoping these would be good so I would have a quicker option in a pinch. As ingredients, home temps, equipment and oven performance can vary in different homes – I would recommend you go with your intuition (as an experienced bread baker) and either knead a little longer, rise a little longer or bake a little longer? It might go over 30 minutes for you, but that is still better than a several hours kind of deal! Can you make this dough ahead a freeze ? I can see these are quickly going to be a problem in my house. I ate three right out of the pan! I could eat these everyday! I have been trying out different bread recipes, found this one easy, but didn’t have much taste. Maybe more salt or other spices? The dough kept crawling up the paddles and even into my mixer top so was a mess cleaning up. Hope to try them again, but any suggestions? You could absolutely add more salt, or even some chopped herbs, extra butter etc if you’d like. This is really just a recipe for “in a pinch”! These are wonderful. Prep time a little longer for me. But I am slow. Thanks a million for sharing. This was my first try with making rolls. Beautiful, soft and a real winner. Can I use milk instead of water and increase the amounts of sugar and salt? Would this ruin the recipe? Thanks once again for your kindness in sharing. Will extra virgin olive oil work? Thank you for this recipe, I made it as healthy as I could, I’m a cancer survivor and am not supposed to eat all purpose flour or white sugar, plus I didn’t have eggs right now so I substituted with heavy cream I used 1 cup spelt flour and 1 cup whole wheat flour and 1 1/2 cup red five flour, extra virgin olive oil and natural cane sugar and sea salt. Turned out amazing I’ve baked bread for the past 13 years I’ve tried a lot of different recipes I always looked for quicker recipes as well, and this one is my new favourite, it did take me longer than 30 minutes cause I don’t have a bread machine plus I let it rise a bit longer and also baked it a bit longer but I didn’t mind it taking longer at all it’s still much better than other recipes- kneading it letting it rise – kneading again letting it rise again then make rolls and letting them rise again it takes up at least half of your day and this one can be made fast in the morning before it gets to hot outside – if you don’t have ac in the house. Thanks for sharing it ? I don’t have a stand mixer so I made these by hand. They were super delicious! However, I noticed I needed about 1/4 cup more flour as they were very sticky. Turned out fantastic and didn’t take much longer! Do you grease the pan for the dinner rolls? you can! I don’t always (I’m usually in a rush), but I bet it would be fine either way. I’ve made these twice now and absolutely love them. Instead of olive oil, I used Canola and I placed them on parchment paper on a baking sheet. Perfect and so tasty and light!! I have many recipes for rolls but this is far the easiest!! I found my Thanksgiving rolls!! YES!! Thank you!! I read the recipe and thought I can do this. But then I realized I had no dough hook or stand mixer. Thanksgiving day and I plunged in and they turned out great. I squealed when I tasted them. Thank you so much. I hand kneaded a couple of minute and let them rise a few extra minutes over my warm oven top. These will be at every large gathering from now on. Anyway to make ahead and freeze? 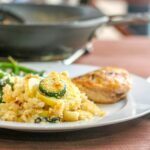 Can I use instant yeast? If so, how much? Thanks! Made them twice now‼️ Quick, easy and yummy. I have a roast in the crock pot and just made these rolls. They came out perfectly. Thiscrecipe was very well written. Follow it exactly as written and the rolls come out perfect! So glad you enjoyed these rolls. We LOVE them, and I’m delighted that you do too.